We are focusing on the ongoing success and progress of our current students. If you would like to be notified next time enrollment opens please enter your name and email address to be the first to know. Because it's all about the followers... right? Being able to follow your dreams and work from anywhere in the world, whenever you want, from the comfort of your smartphone... that's what we're all about. Look, you can keep banging your head against the wall hoping to get more followers and try to build an account using trial and error... OR you can follow a PROVEN PLAN with STRATEGIES that will lead to more growth than you ever thought possible. Nobody said it was going to be easy, this is NOT a "Get Rich Quick" scheme, you have to dedicate yourself and put in the work. But if you follow the guidelines we teach, build a powerful community of people to support you along your journey, there is no reason you can't achieve even higher goals. You might be asking "how is any of this possible??" The way advertisers spend money has changed forever. It's now ending up in the hands of people like you and me, who have grown large followings on Instagram. And with over 500 million Daily Active Users, there has never been a better time to learn how to build and grow a profitable Instagram account and stand out from the rest! The opportunity to take advantage of this is NOW. So stop watching other people live their dream life and start creating yours today. We have students, clients, and friends who have landed Film and Television roles, started successful YouTube channels, sold their Artwork and Creations, Travelled the World with their friends and family, gotten on stage at TED, raise $10M for Start-ups, and make 6 and 7-figures a year, all because of the powerful brand they've built on Instagram. I have always loved being a content creator, and social media has made it possible to turn that passion into a full time career. I've created a brand and business based around a lifestyle of travel and adventure with High On Life. In 2015 I discovered the world of Instagram growth and marketing and have been completely infatuated by it. We have since built a media company comprised of a network of over 15 Million in house followers and a full time team and business managing various campaigns. When I first jumped on board and began learning the game to building Instagram brands, I couldn't help but be completely distracted by the abundance of ways to monetize everything. Once I really dove into the Instagram community, I was blown away at the businesses some of these "kids" were running! I'd have daily chats with dudes telling me they made $1k by lunch time, while they were sitting in their grade 10 math class!! I spent most of my time exploring this world. Aside from the financial opportunity, what excites me most about Instagram is the ability to impact and create waves of positivity, inspiration, and change in the world. All about how you can create an amazing page or brand and grow your Instagram following to a Million followers and beyond! Extra modules that teach you how to make money from your Instagram following and take shortcuts directly to the top. Your Network is Your Net Worth. Connect with us and other students and collaborate on your journey to Millions Of Followers! Instagram Millions is the course to take if you intend to succeed on Instagram. There is a mind-blowing world hidden behind the scenes of this powerful social media platform that has never been exposed - let alone taught - as thoroughly and as clearly as it is in this course. As someone who has dedicated 4 years to creating content for a luxury travel audience, I can attest that the single greatest leap I have ever taken in terms of both tangible audience growth as well as opportunities to collaborate with brands has been as a result of implementing the strategies taught in this program, which helped me grow from 50k followers to 140k in less than eight weeks, with even stronger engagement than I had before the big algorithm change. IG Millions is the real deal. Get in on it. If you're a Singer, Actor, Model, Athlete, Photographer or Videographer, World Traveler, Business Owner, or want to Inspire others, IG Millions will give you the tools and strategies to not only build a powerful Instagram brand but also a platform that will make you money and bring you endless opportunities regardless of it you have 100, 500, 1000, or 100,000 followers already. Anyone who goes through this course, and implements the techniques given, will see success and reach 1M Followers. How to make over $100k/Year from your Instagram account! When we first started to see success on Instagram, a lot of things began to happen for us. Between traveling the world for a living, building a thriving Media Company in our hometown, and working with brands we loved, we realized other people wanted this information and wanted to understand how to do it too. BUT NOBODY WAS TEACHING THIS STUFF! 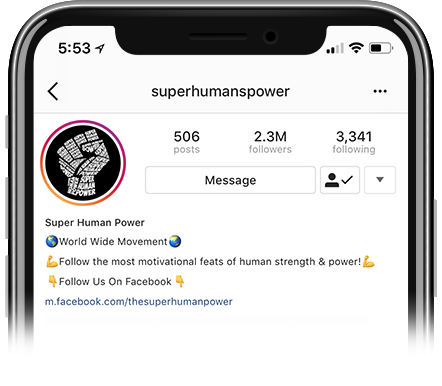 After we posted our first Instagram Marketing video showing how to grow an Instagram to 100k followers in 48 hours, we received over 20,000 emails in 5 days, and it hit 1M views in under a month. People were killing for this kind of information, and that's why we developed IG Millions. Because by understanding how to build a powerful Instagram brand, you're able to pursue a life driven by your biggest passions, sharing content you love with the world, and more importantly, become your own boss, work your own hours from anywhere in the world, and have the ability to build thriving 6 and 7 figure businesses like so many people we know. What is your "Secret" to boosting engagement?